The driving force behind cancer? Tumors consist of a heterogeneous mix of cells within which exists a population with properties that are similar to those described for tissue stem cells. These properties include the capacity for self-renewal and asymmetric division resulting in the generation of daughter cells destined to differentiate. The ultimate role of stem cells is tissue regeneration. Within tumors this stem like population of cells are known as cancer stem cells (CSCs). Other properties ascribed to CSCs include phenotype plasticity, the ability to remain dormant and a resistance to conventional cancer therapeutics. The phenotypical plasticity of these cells may contribute to metastasis enabling the cells to acquire mobility possibly through processes such epithelial to mesenchymal transition (EMT) (Liu et al. 2013). The ability of CSCs to remain dormant and their resistance to common cancer therapeutics are thought to be behind the reoccurrence of cancer. Consequently CSCs are now the target of therapeutic research. Despite the considerable body of work on the subject the precise origin and role of CSCs in tumor initiation remain disputed. There are several potential origins for CSCs including a somatic stem or progenitor cell that has acquired an oncogenic mutation. Equally it’s possible that CSCs arise from the plasticity of a heterogeneous tumor. Figure 1 illustrates the possible routes from which a CSC may develop. Fig. 1. Generation of a CSC. CSCs may develop directly from an adult stem cell which has undergone an oncogenic transformation. This is also the case for the slightly more differentiated progenitor cell. It is also possible that the CSC is derived from the heterogeneous population of cells in an already developed tumor. CSC were defined by a working group at the 2006 American association of cancer research as cells within a tumor capable of self-renewal and with the ability to generate heterogeneous lineages of cancer cells. Defining the role of the cancer stem cell relies on determining whether or not the CSC is the tumor initiating cell. There are two potential theories which may not be mutually exclusive. The first of the theories is the hierarchical model. As seen in Figure 2, the hierarchical model assumes that the CSC is the cell of origin (for example, the first abnormal cell that initiates the tumor). From these self-renewing CSC diverse populations of cancer cells emerge through a process known as asymmetric division. Fig. 2. 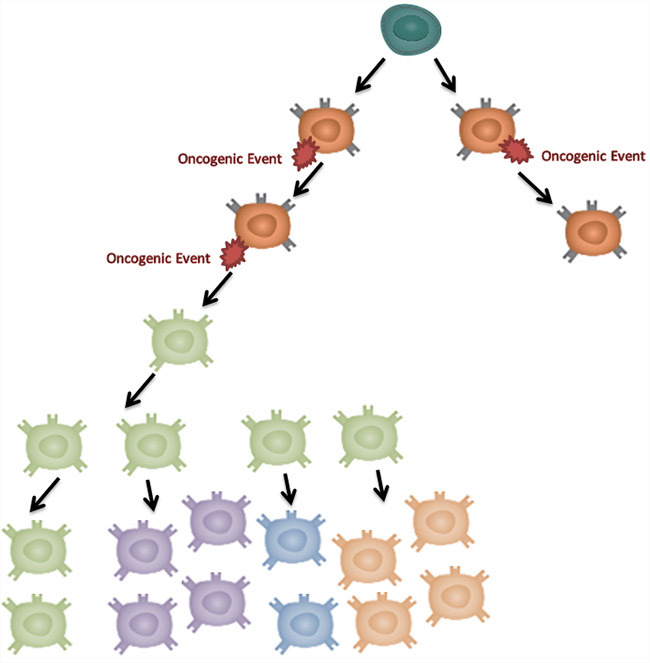 Hierarchical model of tumor development. This model proposes that the various differing populations of cell that compose tumors ultimately derive from a CSC. As mentioned previously, due to cellular plasticity in the developed tumor, some have theorized that CSC may arise from the mature tumor. Even if it is not the cell of origin, the CSC may be the cellular subset within the tumor that uniquely sustains primary and metastatic tumor growth due to its stem like properties of self-renewal and mobility. The second of the theories is the stochastic model. The stochastic model proposes that the heterogeneity found in a tumor is the result of clonal evolution without a necessary cellular hierarchy as shown in Figure 3. Tumor cells acquire mutations over time producing different populations. Additional cellular plasticity provides further population diversity and may be responsible for generation of CSCs. Fig. 3. The stochastic model of tumor development. This model proposes that each cell within a tumor is equally likely to be the cell of origin. Diversity of cell populations in tumors is achieved through accumulation of transformative oncogenic mutations and cellular plasticity. Adult stem cells reside in specialized microenvironments known as niches. Niches provide cellular cues such as secreted factors (for instance cytokines) or cell-to-cell interactions. Stem cell niches are located in the intestinal, neural, epidermal and hematopoietic system (Voog and Jones 2010). Similar to normal stem cells, CSCs also reside within a niche which forms part of the larger tumor microenvironment. These cells secrete factors that promote angiogenesis, CSC self-renewal and attract other cell types such as fibroblasts (Ye et al. 2014, Oskarsson et al. 2014). The CSC niche may be responsible for the conversion of fibroblasts into cancer associated fibroblasts (CAFs). What is clear is that local environmental cues are critical to CSC behaviour (Marusyk et al. 2014) as well as that of other tumor associated cells. The study of CSCs is hampered by a number of issues including the low abundance of CSCs, their presence as part of heterogeneous mix of cells and their variability according to the type of cancer. In order to detect and isolate CSCs, samples must be stained with antibodies against markers specific for the CSCs found in that particular form of cancer. Once the tumor cells are stained they can be sorted from the non-CSC population of cells which make up the majority of the tumor. Table 1 lists several of the common markers found on CSCs. Markers of CSC vary in different forms of cancer and also within histologic subtype. Immunophenotyping is only the first step in the identification of CSCs. The only way to truly define a CSC is through functional assays. These provide the ability to test if the proposed cell population has stem cell like abilities such as self-renewal and the ability to generate heterogeneous populations. One such assay is the colony forming cell assay in which cells are seeded at low density in a semi-solid medium in the presence of a particular cocktail of cytokines. The number and type of colonies that form are then counted providing an assessment of the CSCs self-renewal ability. Sphere forming assays assess the CSCs ability for self-renewal and thereby to grow in suspension and form 3-D sphere-shaped structures. Sphere-forming is a characteristic of self-renewing cells (Tropepe et al. 1999, Ajani et al. 2015) however it is also likely that the sphere contains non-CSCs also. Pastrana et al. 2011 provides useful tips on developing and troubleshooting a sphere forming assay. Serial transplantation assays involve tumor isolated cells transplanted into immunodeficient mice by limiting dilution, after which tumor growth is scored within several weeks or months. Different tumor initiation capacities between cell subsets are then interpreted as evidence for the presence of CSCs in the primary tumor. The primary limitation of transplantation assays and other CSC assays is that, due to the change in TME, they cannot reveal the actual fate of the transplanted cell in its original tissue or tumor. For more information on the development and progression of cancer visit our pages on immune checkpoints, tumor microenvironment and cancer research posters. Ajani J et al. (2015). 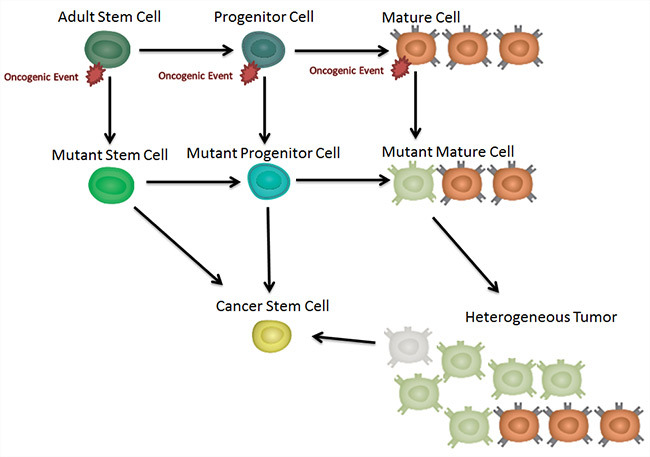 Cancer stem cells: the promise and the potential. Semin Oncol 42, 3-17. Liu S et al. (2013). Breast cancer stem cells transition between epithelial and mesenchymal states reflective of their normal counterparts. Stem Cell Reports 2, 78-91. Marusyk, A et al. (2014). Non-cell-autonomous driving of tumour growth supports subclonal heterogeneity. Nature 514, 54–58. Oskarsson T et al. (2014). Metastatic stem cells: sources, niches, and vital pathways. Cell Stem Cell 14, 306-321. Pastrana E et al. (2011). Eyes wide open: a critical review of sphere-formation as an assay for stem cells. Cell Stem Cell 8, 486-498. Tropepe V et al. (1999). Distinct neural stem cells proliferate in response to EGF and FGF in the developing mouse telencephalon. Developmental Biology 208, 166-188. Voog J and Jones D (2010). Stem cells and the niche: a dynamic duo. Cell Stem Cell 6, 103–115. Ye J et al. (2014). 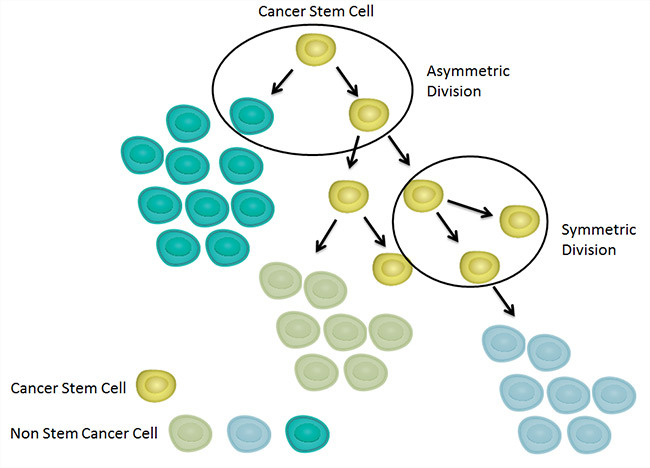 The cancer stem cell niche: cross talk between cancer stem cells and their microenvironment. Tumor Biol. 35, 3945–3951. Plaks V et al. (2015). The cancer stem cell niche: how essential is the niche in regulating stemness of tumor cells? Cell Stem Cell 16, 225-238.